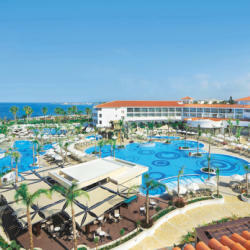 Alexander The Great Beach Hotel is a luxurious hotel in Paphos located on the southwest coast of Cyprus. This four star hotel is built right on the beach adjacent to an archaeological site. Within only a few minutes walk one can reach the Paphos fishing harbor and the tourist center. An award winning and well established hotel, with thousands of visitors year round, the Alexander The Great is preparing for a new era. March 2013 finds this hotel establishment upgraded in every way. 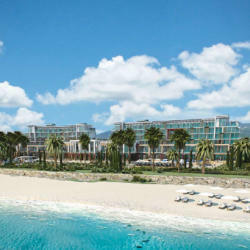 All 202 luxury guestrooms provide, comfortable and elegant interiors, a wide range of amenities and unique inland, side sea or front sea and pool views, from the balcony. Room types at the Alexander The Great Beach Hotel include Deluxe Rooms, which accommodate up to three persons. Spacious bathrooms with marbles and exclusive toiletries, a minibar, TV and entertainment system, internet are some of the new standard amenities. Superior Rooms come to add more space and comfort and all offer front sea view. The new Superior Garden Cabanas with sea view, some with private swimming pool and Jacuzzi are located separately in the garden area and enjoy a private sundeck terrace. Special guests may choose the Royal Penthouse Suite, a luxury two bedroom suite which accommodates four persons. Located on the third floor it enjoys front sea views and privacy. Bathrobes, slippers and brand toiletries form a touch of luxury. Meals at the hotel range from contemporary Japanese at the outdoor Kiku Restaurant with live cooking, to Italian gourmet at the Garibaldi Ristorante Italiano with a four course menu of both authentic and modern Italian cuisine. Roxanne Restaurant is the main indoor restaurant featuring extensive buffet, cooking shows and sweets, as well as a variety of themed buffets such as traditional Cypriot. Limanaki Greek Tavern overlooks the Mediterranean offering traditional meze dishes using local ingredients. Alexander Cocktail Bar open during daytime and evening offers drinks in a sophisticated environment accompanied by a wide repertoire of live music every night. The new swim up pool bar and restaurant offers refreshments, snacks and ice creams. Further to that Cafe Royal serves breakfast and lunch buffets. Guests can enjoy evening parties and shows at the Havana Entertainment Venue. At the Alexander The Great Hotel leisure facilities and scheduled activities apply to all ages and preferences. On the beach there is a water sports and scuba diving center and a beach volley net while, on site, there �are a tennis court and games areas with table tennis, billiards and darts. �Kids can enjoy a special program with creative activities, fun games and competitions. The animation team organizes activities from dance lessons to aqua aerobics while at night varied entertainment shows take place. A large free form outdoor swimming pool is ideal for relaxing in the water and so is the indoor swimming with Jacuzzi. Serenity Health Club and Spa features luxurious treatment rooms, professional therapists using world class marine based products. A well equipped gym providing exercise classes, a Jacuzzi, a sauna and steam bath are found at the health club area. If business and incentives are the reason of a trip, Alexander The Great is ready to accommodate every need of the delegates. The hotel provides conference rooms which can cater for up to 200 delegates in theater style while they can be set up to boardroom, banqueting or classroom style. An adjacent TV, audiovisual equipment and internet room supports the technology related demands of any kind of meeting. Catering services are tailor-made and vary from coffee breaks to full course meals. With years of experience in the tourist industry, commitment to the customer and impeccable service as the key ingredients, Alexander The Great Hotel Paphos has achieved to place itself among the leading hotels in Paphos. Today, it suggests a perfect choice for the most exciting holidays!